Production of LOGSTOR company, the world leading manufacturer of pre-insulated pipesystems, is designed for heat loss reduction of transported media to absolute minimum. LOGSTOR Marine unique pre-insulated pipe systems design ensure fast and easy installation on site. Corrosion protected materials and 100% waterproof design provide significant longer lifetime than conventional insulated cargo deck pipes. The heart of all LOGSTOR pre-insulated pipe systems is the unique cyclopentane-blown, CFC-free polyurethane cellular foam. Carrier pipe material depends on transported media. The jacket pipes are usually made of black high density polyethylene. To accommodate the high operating temperatures, pipes are fitted with additional inner layer of mineral wool. In environment where there is a risk of frozen temperatures, we supply pipes with built in, self-regulating heating cable or tracer pipe. LOGSTOR Marine production can be used for transportation of media with operating temperatures from -200?C to 315?C and applicable for installation on any ships including chemical carriers and LNG tankers. Pre-insulated pipes are supplied in length up to 12 m. Elbows, branches and spools are supplied according to customer specification. 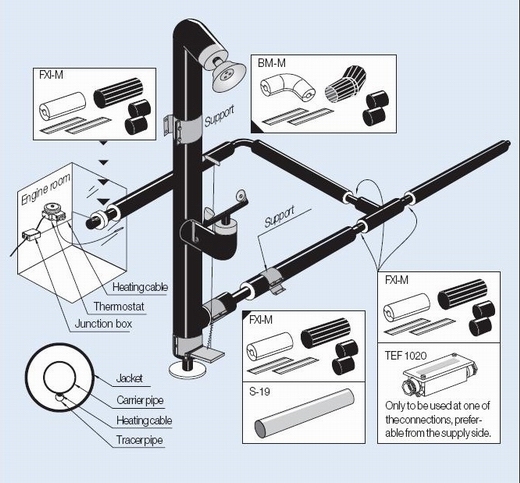 Based on pre-insulated pipe technology, LOGSTOR designed emergency shower, which keeps all benefits of pre-insulated systems: 100% waterproof insulation; maintenance free; simple and fast installation; built-in heating cable approved for use in hazardous areas.